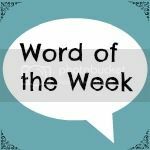 Share the post "Word of the Week 18/9/15"
Hello and welcome to Word of the Week. Yes, I know this could often be my word, but this week it covers so much! Last weekend I launched my new paper-loving initiative, #SundayStationery. A chance to browse and ogle pretty stationery every weekend, and so easy to get involved with, too. You can find out more about it here if you’re partial to a little stationery yourself, it kicks off this weekend. I’ve had lots of new books. Like I needed more on my reading pile? If you saw my post on Wednesday, you’ll know that I had the absolute pleasure of working with The Beautiful Book Company, so I’ve received some great reads from them (there are some up for grabs, too!) and I couldn’t resist a forage about in the second hand bookshop on a National Trust outing at the weekend – four more books bought, must make time to read more! I’ve had my second full day of Open University studying, and there’s something so satisfying about having text and source books to get lost in, whilst making copious notes in my pretty notebook. I’m thoroughly enjoying immersing myself in it all each week, so I do hope that this passion lasts and I am actually on the right track – the first assignment will tell me, I suppose. I’ve received some lovely snail mail this week. I’d had a bit of a happy mail drought, as happens at times, but with a dozen pen pals, it shouldn’t happen too often! Well, the drought is over as I’ve received some lovely letters this week, which has been great. I’ve also signed up to the back to school stationery swap over at The Crafty Lass and have received my partner’s details this week, so I’ll be putting together a papery package for her over the weekend. What about you? What one word sums up your week best? Please grab the badge, link up and share. Win £150 Smyths Toys Gift Card with Lego Scooby Doo! Great work and very “you”. I’m with you on the paper front, have ordered one of those very whizzy personalised planners, can’t wait for it to arrive. I saw someone else say paper was *your* word 🙂 I love your enthusiasm for it. Lots of new reading material too! Lovely! A great word to be synonymous with! Great word! I’ve just ordered some new stationary :). Glad to hear you are enjoying your course. Oooh yay for paper and goodies! Looking forward to #SundayStationery pondering what I can photograph to share this week! Hi Jocelyn, it’s good to hear that you’ve started your Open University course. I remember reading a while back that it was something you wanted to do. I do like a bit of snail mail too and have one person I keep in contact with using pen and paper, I would love more, but I am just not organised enough to keep on top of writing….I do like the sound of your planner though! A perfect word for you, and as I was reading this post I could virtually hear you smiling as you were writing it! I do like a bit of old skool pen & paper myself, I still can’t be without my paper diary or my wall chart organiser! And long may it continue! A great word of the week. I have found so many lovely notebooks that I stored and forgotten I even had! It was better than finding money in a coat I haven’t worn since last winter!! Ah, that’s a great feeling!